We are at Tidal Inlet. A place we identified by tracking the tour boats AIS transponder last year. Perfect ground for bears as there is a stream where Salmon spawn. 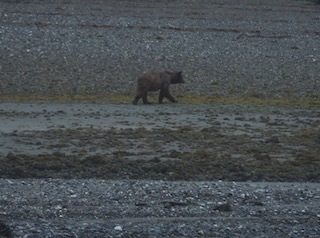 As soon as we enter we spot a grizzly bear close to the waterline at low tide. 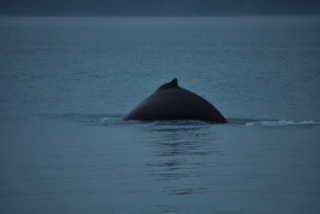 In addition we spot a whale at her hunting ground. 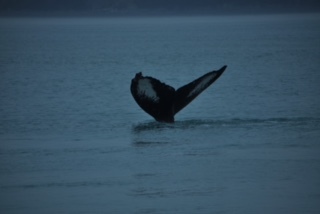 Prior to getting here we spotted three Humpback whales hunting in deep waters up to 150m. This created spectacular tail dives. Weather is still lousy but we enjoying the splendor of nature here at Glacier Bay National Park.